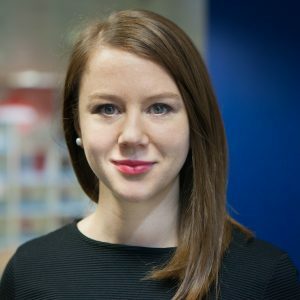 Ola Suszczynska-Jones is a programme manager at Duke Corporate Education where she executes the end-to-end experience of Duke CE’s leadership programs. She is responsible for all the logistical aspects of development initiatives collaborating with clients, educators, participants and her team to ensure a smooth and professional experience. Ola has worked with clients from various industries including energy, manufacturing, engineering and financial services. She has delivered programs in multiple locations within the UK, Europe and North America. Previously Ola worked in the shipping industry and an advertising agency where she has managed logistics for various functions including accounting and human resources, as well as being an executive assistant to CEOs and senior executives. Born in Poland, Ola grew up in the port city of Szczecin where she obtained a Masters in Political Science and Intercultural Communication at The University of Szczecin. Her dissertation was based on historical aspects of human rights for Islamic women in Iran and as part of her research she studied at Selçuk University in Konya, Turkey. Since then, Ola has held a passion for history, social and political issues. She enjoys reading, travelling, cooking and immersing herself in new cultures. Ola speaks English and Polish and risks a little Russian.